Durrat Marina, Phase One ... in progress. Inovest, a leading Bahrain-based Sharia-compliant investment company, has signed on as a strategic supporter of the Gulf Property Show. Inovest has a substantial portfolio of projects that cross several industries; the company’s forays into real estate investment are delivered hand in hand with its primary subsidiary Al Khaleej Development Company (Tameer). The company has delivered several notable residential, commercial, and industrial real estate based projects in Bahrain including Tala Island in Amwaj, the Bahrain Investment Wharf, Takhzeen, and others. 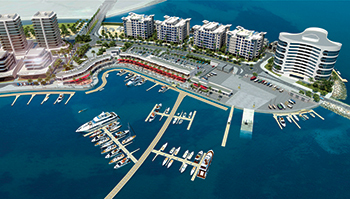 Central to the group’s presence within the show is one of its key project companies, Durrat Marina. Said to be the Middle East’s first mixed-use marina development, Durrat Marina will showcase progress on Phase One of the overall development, including infrastructure, villas and residential apartments as per the masterplan, as well as the marina promenade which will host an array of cafes and retail outlets, and will enable the creation of a “downtown” arena for both Durrat Al Bahrain and Durrat Marina residents. A Durrat Marina team will be handling enquiries on plots of land available for investment and development. On each project, the group prides itself on delivering maximum value to investors and end-users. Inovest will be at Stand GP71 at the Gulf Property Show.